An insight in the cooperation between Comtest Engineering and France leading test laboratory, Emitech Group. Comtest Engineering is proud of its many achievements for Emitech, which is the largest test laboratory in France and one of the largest in Europe. In 2016 two full compliance fully-anechoic rooms (FAR) for 3m measurements according to the CISPR and IEC Standards, one in Montigny le Bretonneux and one in Angers, a full compliance semi-anechoic chamber (SAC) in Montpellier and one CISPR-25 Ed. 4.0 anechoic chamber in Etupes for the Emitech/EuroCem laboratories. In 2017 we supplied one CISPR-25 Ed. 4.0 in Angers, two full compliance semi-anechoic chambers (SAC), one fully-anechoic room (FAR) and three CISPR-25 Ed. 4.0 rooms in Montigny. 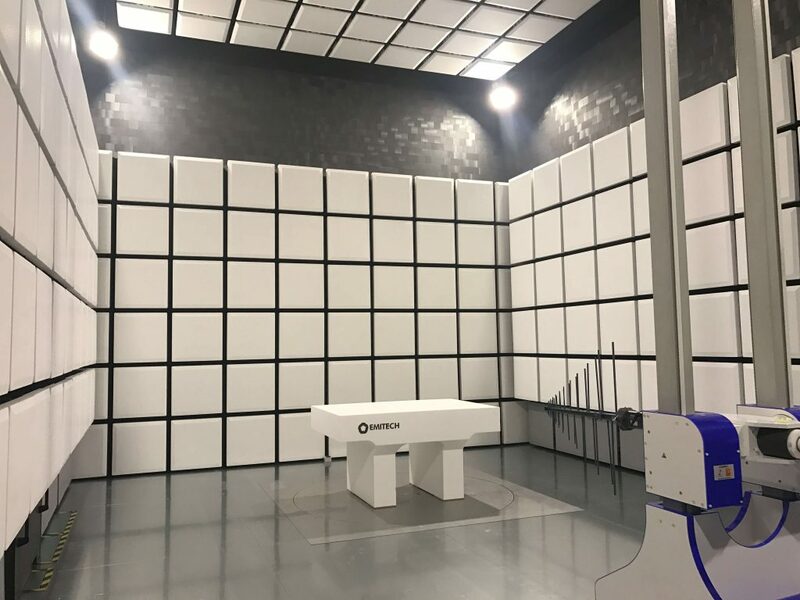 Comtest installed one fully-anechoic room (FAR) at Emitech Chassieu in 2018. In 2019 one MIL-STD-461 components chamber has been installed in Montigny, just completed in January. One more MIL-STD-461 for components and vehicles with a large 3×3 meter door will be completed in March. Moreover, Comtest has supplied the Emitech Group with absorbers for upgrading some existing chambers in Montigny and Le Rheu. All chambers have been built at a speed record by our highly experienced team highlighting Comtest skills in project management, logistics, planning, etc. As an example, one 3m SAC, one 3m FAR and three CISPR-25 rooms have been built in 3 weeks. We have a special thanks to Emitech for the perfect cooperation over the past 3 years and the always proactive attitude and precious inputs. Nous remercions beaucoup l’équipe d’Emitech pour la coopération parfait, l’attitude proactive et tous les inputs précieux pendant ces 3 ans de cooperation.